If you are looking for information on the Moe's Southwest Grill franchise business opportunity, Moe's Southwest Grill franchises or Moe's Southwest Grill franchising, then you have come to the right place. 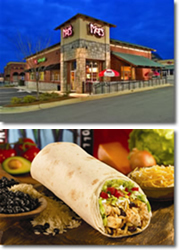 In the winter of 2000, when the first Moe's Southwest Grill opened its doors in Atlanta, GA, customers were introduced to a new restaurant concept that served fresh Southwestern food in an atmosphere that made everyone feel welcome whether you were grabbing a bite for lunch with a co-worker or taking the family out for dinner. Moe's was an immediate hit that quickly became known for its appreciation of classic rock, cool-without-trying-too-hard personality, and of course, the best burritos this side of the border. As the fast-casual segment continues its explosive growth, Moe's Southwest Grill is positioned for even greater success as a leader and innovator in its category. In fact, Moe's was listed in the top ten of Fast Casual's "Top 100 Movers and Shakers" in 2005 and 2007 and ranked # 2 top new franchise by Entrepreneur Magazine in 2006. With the addition of Moe's, FOCUS Brands is now the franchisor and operator of over 2,100 ice cream stores, bakeries, restaurants and cafes in the United States, the District of Columbia, Puerto Rico, and 32 foreign countries under the brands names Carvel ®, Cinnabon®, Schlotzsky's®, Moe's Southwest Grill ® and the franchisor of Seattle's Best Coffee® on military bases and in certain International markets. Based in Atlanta, the primary objective of FOCUS Brands is to FOCUS on making people happy!